RIPON Grammar School’s reputation for sporting excellence is to be given a massive boost as work begins on a new world-class, purpose-built artificial grass floodlit pitch. It’s been several years in the planning, but now the new 3G ‘third generation’ all-weather surface, which will also benefit the wider community of Ripon, is about to become a reality. Work is due to begin on April 8, when contractors will start to prepare the site, with the pitch construction starting the following week. Students will begin playing on this exciting new facility, which is fully-funded by a property developer, in the autumn term. There are also plans for a new changing block, providing dressing and locker rooms, showers and toilets for about 80 students, with office space and storage, due to open at the same time. Ripon Grammar School has built a regional reputation for sporting success, with girls’ hockey and netball teams recently winning national titles and two rugby teams being crowned Yorkshire champions. Headmaster Jonathan Webb said this latest addition to the school’s first-class sports facilities was an amazing asset for the school, which would help further enhance the development of the next generation of sporting stars. “This will make a huge difference to the amount of time students get to train and play outdoors as the top-quality playing surface performs well even in the most challenging weather conditions in the muddy depths of winter. The pitch encompasses a full-size FIFA-compliant football pitch and three cross-width seven-a-side football pitches, all with markings and goals on wheels. It will also provide a full-size World Rugby-compliant artificial pitch, with markings and rugby posts. Alongside this, contractors will re-level and re-site the 1st XV grass rugby pitch, as well as installing drainage, to create another first-class facility. The 3G pitch’s durable, all-weather surface, with porous layers which let water drain through easily, can be played on for 80 hours a week, as opposed to the five hours a week natural grass pitches can withstand. It will be used solely by the school up to 5.30pm but will be available for public hire in the evenings, weekends and holidays. The new facility will also serve two partner clubs, Ripon RUFC and Ripon City AFC and two illuminated footpaths will link the 3G pitch with the sports hall and car park for student, parent and public access. 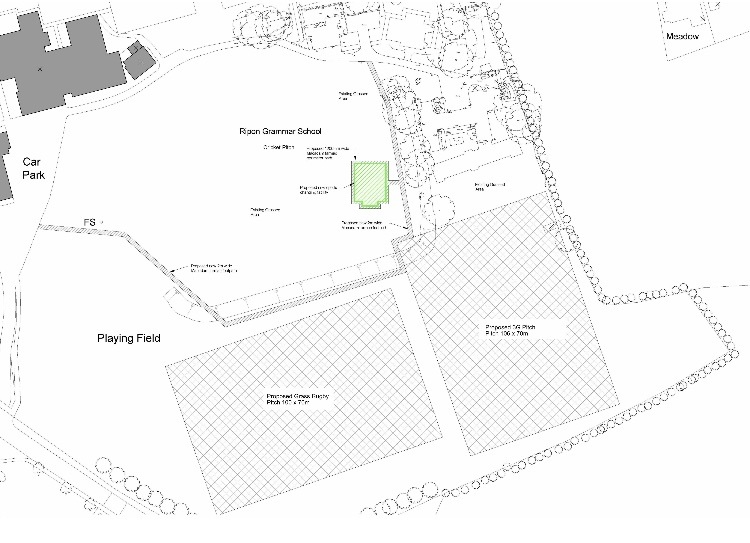 Persimmon Homes agreed to fund the sporting facility - which will be part-constructed on the Memorial Field owned by the school’s Old Riponians alumni society - as part of the planning requirements for a new housing development in the city.